As fighting continues to force civilians out of Libya, the international medical humanitarian organisation Médecins Sans Frontières/Doctors Without Borders (MSF) calls for a stronger humanitarian response by the countries engageed in this war, and more effective protection for the people who are fleeing the conflict. Over 600,000 migrants have crossed Libyan borders since the beginning of the war. If many have already been repatriated to their country of origin, thousands are still stranded and continue to arrive in transit facilities in Tunisia, Egypt, Italy or Niger. 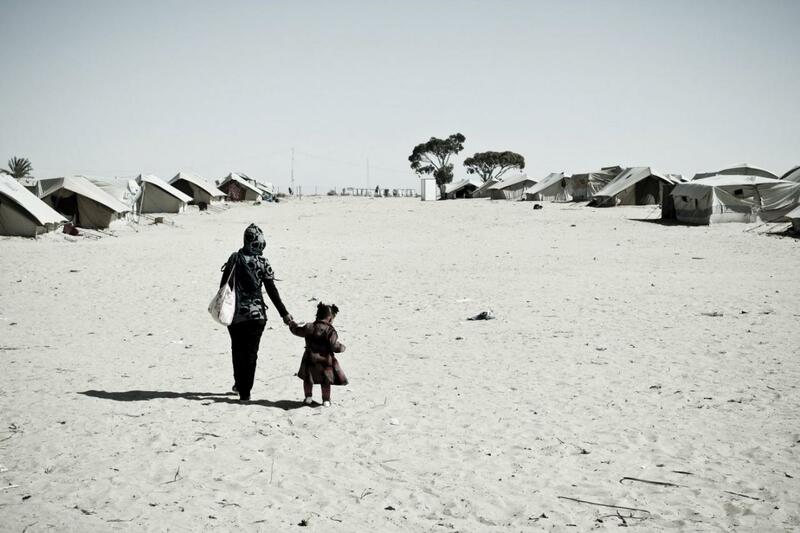 In a briefing paper released today, entitled “From a Rock to a Hard Place: The Neglected Victims of the Conflict in Libya”, MSF highlights the consequences of insufficient protection and poor reception conditions in the countries where they have sought safety. In Shousha camp in Tunisia, some 4,000 people – mainly Sub-Saharan Africans – cannot be repatriated, primarily due to dangerous situations in their countries of origin. Meanwhile 18,000 people have landed on Italian shores since the beginning of the conflict, risking their lives in overcrowded, unseaworthy boats in a bid to flee the war. Since February, MSF teams have provided more than 3,400 mental health consultations to people fleeing the conflict, both in Italy and Tunisia. Staff have heard numerous stories from patients of their migration journeys in search of a better life. Some had already been victims of violence in their home countries, while many faced extremely dangerous situations on their way to Libya. A number of people suffered various traumatic experiences in Libya itself: they fled NATO bombings, were targeted or held in Libyan jails and detention centres – as a result of lacking the right documents, or of being ‘pushed back’ when they tried to reach Europe. As their freedom of movement is severely limited, confinement in transit camps and reception centres is tantamount to detention. “The process of determining who qualifies for asylum in Italy is extremely lengthy and many people express total desperation at the idea of spending months or even years in these centres”, says Francesca Zuccaro, MSF’s head of mission in Italy. In Shousha camp, living conditions are inadequate for a long-term stay and safety has become a growing concern, as demonstrated by the violent clashes in the camp in May. The violence exacerbated widespread feelings of despair amongst those in the camp. Some have left the camp to attempt journeys across the Mediterranean sea, risking their lives in the hope that their reception will be better in Europe. “As they have no prospects in sight, dozens have gone back to Libya in the past days, ready to risk their lives again in a desperate search for a future. This is an extremely worrying situation,” says Mike Bates, MSF’s head of mission in Tunisia. By invoking the fight against illegal immigration, European states risk denying the protection and humane treatment that these people deserve, condemning them to a situation of uncertainty which increases their suffering. The influx of people arriving by boat on Italian shores does not constitute ‘illegal immigration’, but a flight towards survival, safety and protection. MSF reminds all belligerent parties and neighbouring countries of their responsibility, under international law, to keep their borders open and offer protection to those fleeing Libya and to ensure that poor reception conditions and lack of protection in no way hinder refugees and asylum seekers from seeking safety.